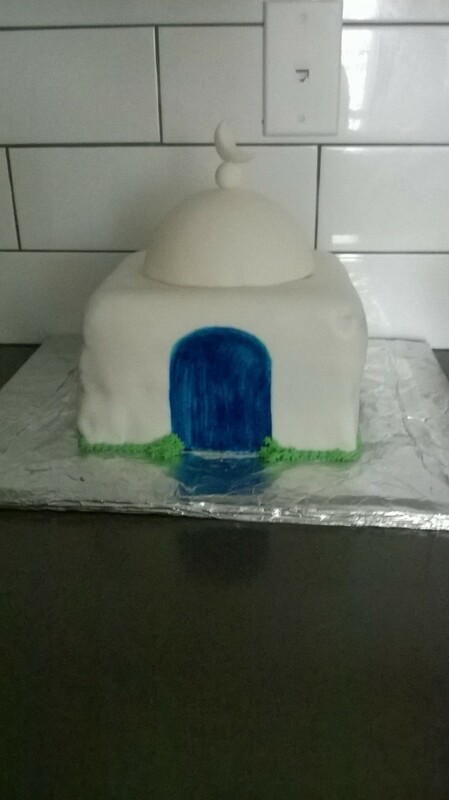 This was my second mosque cake.Its 3, x 9 cakes covered with fondant.I painted the fondant with the sky blue icing color.I used green butter cream for the grass. 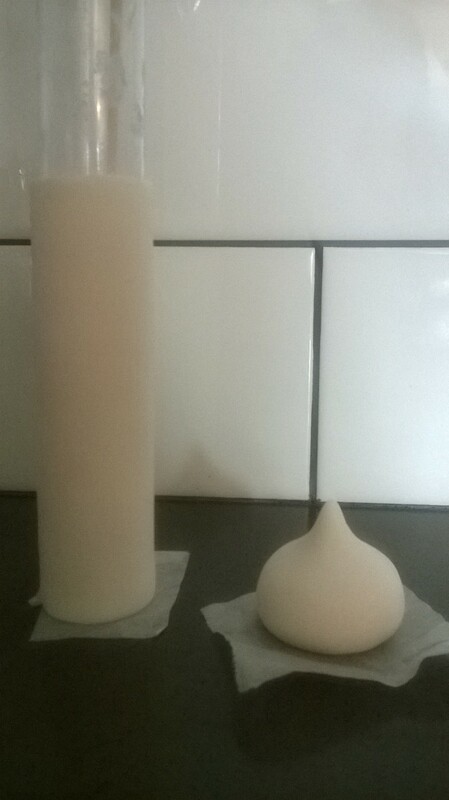 The dome and minaret,made from two parts(pictured separately and placed on a side of the cake at it’s final destination) were a challenge.I made a dough of gum paste and fondant for these parts, equal parts of fondant and gum paste. Dome was made by placing a thick layer of the white mixture dough on top of a circular bowl.Let it dry overnight. Once it was hard, I moved the bowl and came the dome.It gave a me hard time but came out in one piece. Phewww! Minaret had two parts:a giant hershey kiss shape and a hollow log.You can take a tiny blob of the dough and shape it as big as the top of the minaret stand(made out of the mini m n m bottle(make sure your hands are sparkling clean or else the “kisses”will have some tiny dots).Secondly,for the log,i found a mini m n m bottle.I flattend out the dough keeping in mind the length of the bottle.I wrapped the flattend dough and glued the sided with the gum paste adhesive(dissolve a tiny ball of gum paste in 1/4 cup of water to make a gumpaste glue).Make sure it is not too tight around the bottle,just snuggly fit(it will come out easily)Let it dry over night.You should have hard hollow log in the morning. I insterted the moon,made out of gumpaste and fondant with a tooth pick attached to a round fondant to the dome.As the dome was hard,I made a tiny top area wet,to make it soft and then inserted the moon. I transported the cake without attaching the dome,and the minaret. Finally,I just placed the parts and viola! I had a hard time with placing the fondant over the base,I guess I am new to this world,but it ended out well.